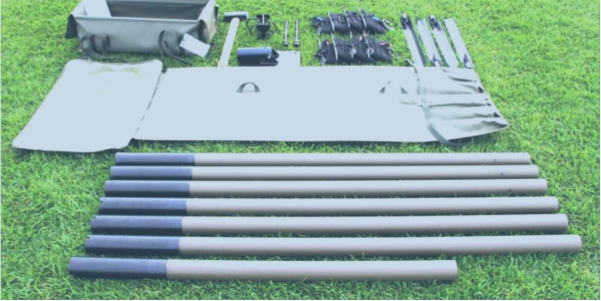 ST is a family of light transportable sectioned masts for elevating antennas (up to 15 kg) 5-12 meters above the ground. Each kit includes guys, stakes & bags. ST-5, ST-8, ST-10 and ST-12 form the family of light antenna masts, composed of tubular sections with joints made of polyester - glass composite material. The mast stands on the tilting base pegged into the ground and is guyed on several levels with high quality ropes. Five and 8 meter masts can hold up to 15 kg top loads. the 10 and 12 meter versions max out at 10 kg. The ST sectioned mast is packed in a two cloth bags and includes all hardware to erect it in the field. Accessories are available for mounting a wide variety of antennas.